If you want to separate the true Summit County locals from the dreamers, just ask them about Heeney. A true local can tell you how to get there and why you should go. In fact, Kelli can give you the complete story; she enjoys relaxing at her lake home in Heeney when work permits. She loves to spend time there taking in the spectacular lake and mountain views, hiking or snowshoeing with her dogs. The pristine mountain lake takes on a whole different feel in the summer when the leisure time is filled with wakeboarding, tubing, skiing, and fishing. The wind surfers and even the cliff jumpers make an appearance now and then. Winter, too, has its beauty when the lake is frozen and the snowmobiles are off and running. Ice fishing is another opportunity for winter fun, but sitting by a roaring fire with a gorgeous lake view is a personal favorite to many. 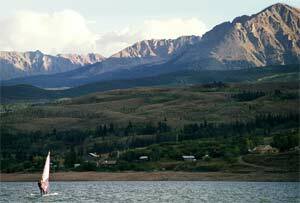 Heeney lies on the banks of the Green Mountain Reservoir and is our smallest, sleepiest Summit County “town” with a year round population of approximately 65 and a few cows. The town is at the lowest most northern end of the county and is often forgotten, but not by the outdoor enthusiasts. The reservoir, unlike Lake Dillon, allows for swimming and waterskiing. So, Heeney is a common destination for water sport lovers, whether they be windsurfers, jet skiers, water skiers, wakeboarders, fishermen or the occasional cliff jumper. Heeney rests at about 8,000 feet above sea level and is nestled between Green Mountain Reservoir and the Gore and Williams Peak mountain ranges. This modest community is only about 30- 40 minutes to Breckenridge, Keystone, Copper Mountain and Arapahoe Basin and offers a unique change of venue from the nearby resorts of Summit County. It was established in the late 1930’s as an offshoot of the Dam construction. There is little commercial development surrounding the reservoir, but you will find a small marina offering boat rentals, a boat launch, a bait and tackle shop, cabin rentals and a quaint restaurant and bar with an expansive deck overlooking the reservoir. The area remains today much the same as it was over 50 years ago. Cattle still graze the beautiful mountains surrounding the lake, and the pace of life is still that of a sleepy, little lake side village. You can expect to encounter deer, elk and an occasional fox along the scenic drive into Heeney. Experience the hospitality and warm welcome that are an instinctive part of the unique little community. Come see for yourself and enjoy a taste of true tranquility which is so quickly disappearing in today’s hectic world. For more information on Heeney real estate contact Kelli today!